The trivialisation of politics perhaps isn’t so trivial. It is now a matter of history that Ed Milliband failed to engage with the UK electorate, and has now resigned as Leader of the Labour Party, having overseen a very poor result for his party. We discuss why in this article. But we did think you might like to ponder this image, too. We saw it served to us on the Internet countless times. Yes, yes – all well and good, and fair game, all’s fair in love and war etc – but we do wonder how ridicule like this seriously affects a politician’s chances, especially as our politics has become increasingly Presidential throughout the Western world. After all, it’s legend that Nixon lost the crucial TV debate with Kennedy because he refused make up and so had a noticeable five o’clock shadow making him look older and unkempt. That hirsute shadow dogged him in virtually every cartoon of him from then till his death. This pic would have been seen by a untold millions of Brits before last Thursday. It hardly enhances the poor chap’s dignity. He can’t help how he looks, after all. And we see these types of memes constantly – the world even had to invest the word meme to describe them – and after a while we are sure they have some sort of effect, and nearly always always negative. The fact that Wallace is a bit of a numpty working-class Northerner won’t have been missed by a few million sub-consciousnesses, either. Hmmm. One of the commonest lines we deliver on this blog is “you can survive anything in politics except ridicule”. We are sure more serious matters were at play, too, but this can’t have helped. And yes, we would be the last people to argue that humour and satire have no place in politics. They serve a valuable purpose and have done for centuries. Nevertheless, we also owe it to those who would govern us to look at issues more than their double chin (Jim Callaghan), the size of their hips or nose (Julia Gillard), their sticky-outy ears (Tony Abbott), their voice (Margaret Thatcher) and so on and so on endlessly. Caricature is fun, but not if it overwhelms everything else. We dumb our politics down too far at our peril. This hilarious little clip has been brought to my attention. It’s Australian comedian and chat show and game show host (busy boy) Adam Hills laying into American comedienne Joan Rivers, for making personally abusive remarks about Oscar-winning singer Adele. It starts with River’s remarks, then Hills lets rip. Such a wonderful (and appropriate) stream of invective I have not seen in many a long year. Oh yes, this is well done indeed, Dear Reader. I strongly recommend you watch. And Joan Rivers? If you’ve got any time left on this earth, I strongly recommend you watch and learn. A one-man whirlwind of political sanity - and laugh-out-loud funny too, to boot. 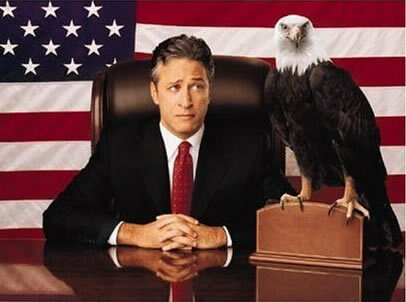 I watched The Daily Show on TV last night with my daughter. A truly inspired piece entitled “World of Class Warfare”, after billionaire Warren Buffet was accused of class warfare for daring to suggest that the uber-rich in America should pay their fair share of income tax. Sadly, I can’t link to it here, because all the streams of it I can find are only available to US viewers – when someone gets it up on YouTube or somewhere that the whole world can see it, please, someone, tell me. This was the most pertinent and powerful piece of political satire I have ever watched in any country. I trust Obama and his team were watching. Bingo, next election won, right there. If Stewart and his writers can get it right so easily, why the hell can’t the Democrats? It was also laugh out loud, tears-in-the-eyes hilarious. I strongly recommend you try and find a stream you can watch. Oh, the kicker? If you raise the marginal tax rate on the top 2% of the richest people in America, you can raise about US$700 Billion … go some way to helping out on Government debt – instead of cutting deep into core services – and they would hardly even notice the take. Yet Fox News and other assorted loonies have jumped on this and called it disgraceful, arguing that the poor should pay more income tax – or any, if they don’t even earn enough to pay some now, well, then, simply get them to pay some. Stewart points out that to raise a similar sum from America’s poor, the state would have to take half of their TOTAL wealth (not just slug them with income tax). Yup, that’s half their pay, their savings, their homes, their food, their cars … etc. The man is a national treasure. I wish we had someone of his satirical standing in Australia. I am reposting this not because the video accompanying the song is especially good, but because the parody of the famous Sam Cooke song is cleverly and precisely executed and the ridicule of the current state of the Republican side of American politics is healthy and appropriate. The continuing failure of the GOP to find serious, quality candidates is astounding – and worrying for all those who may not be on their side of politics, but who believe that the survival of democracy rests on both good government and a principled, healthy opposition. Enjoy, whatever you think of the politics. 4813th antigay Republican congressman outed as gay « skepgineering.